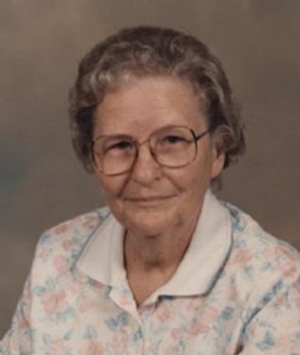 Obituary – Myers, Delores Ethel (Shappell) « Perry High School Alumni Association, Inc.
Delores E. Myers was born August 27, 1929 in Roxanne, Oklahoma to Marion and Mary (Gilmore) Shappell. She passed away Saturday, April 18, 2015 at Green Valley Nursing Home in Perry, Oklahoma at the age of 85. Delores graduated from Perry High School class of 1947. 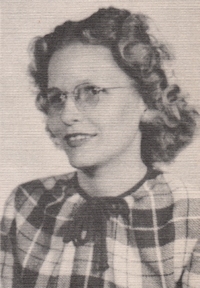 Later in life, she went on to attend college at Oklahoma State University. On January 4, 1948, Delores Shappell and Basil Myers were united in marriage in Perry, Oklahoma and to the union, three children were born. Delores worked for Oklahoma State University for 27 years as the Sr. financial assistant for the Arts and Science Dean’s Office. She was a dedicated member of the First Assembly of God Church in Morrison. While her time there, she served as the church pianist, the church secretary, Sunday school teacher, and youth leader. Delores was a member of the Oklahoma Retired Educators Association and the Perry Memorial Hospital Auxiliary. She enjoyed singing, playing the piano, taking walks and traveling. Delores is survived by three children, Becky Moran and her husband, Mark of Perry, Lana Fuxa of Grand Prairie, TX, and Terry Myers of Morrison; one sister, Evelyn Coe of Perry; four brothers-in-law, John St. Clair of Perry, Melvin Myers and his wife, Joyce of Ponca City, Leonard Myers and his wife, Pat of Broken Arrow, and Kenneth Myers of Allen, TX; nine grandchildren, Jami Wittman, Aaron Myers, David Fuxa, Mary Murray, Jana Fuxa, Loretta Sloan, Michelle West, Robyn Mangum, and Ross Moran; 14 grandchildren; and numerous nieces and nephews. She was preceded in death by her parents; her husband; two sisters, Rosemary St. Clair and Verna Smith; and two brothers-in-law, Leroy Coe and Bill Smith. Public viewing is scheduled from 8am to 8pm, Thursday and Friday, with the family greeting friends and family on Friday, April 24, 2015 from 6pm to 8pm. Funeral services will be 10am, Saturday, April 25, 2015 at First Assembly of God Church in Morrison, Oklahoma with Pastor Dennis Hall officiating. Interment will follow in Hayward Cemetery in Covington, Oklahoma. Memorial contributions may be made to Hayward Cemetery Association, Wheatheart Nutrition and/or the First Assembly of God in Morrison in care of Brown-Dugger Funeral Home, 1010 N. 7th, Perry, OK 73077.